When it comes to the Christian sacrament of the Holy Supper, it’s all about eating and drinking. That’s true whether we look at it physically, philosophically, spiritually, or interpersonally. Though our observance of this sacrament is based on the Lord’s Last Supper with his disciples, let’s look at an earlier story of Jesus feeding the people, from the Gospel of John, chapter 6. I encourage you to click the link and read the chapter first. One fine day in Palestine about two thousand years ago, a large crowd of people was following Jesus because they had seen the miraculous healings he had performed. He had crossed the Sea of Galilee out of the Holy Land proper, and had gone up a mountain with his disciples. When he saw the crowds surging toward them, he had them all sit down—five thousand men, plus women and children (see John 6:10; Matthew 14:21). And then he fed them. Yes, he fed them in a miraculous way, making five small barley loaves and two small fish multiply to provide everyone as much food as they wanted. But for now, let’s just pay attention to the simple fact that he fed them. For nearly two thousand years now, Christian theologians have been debating and expounding upon the meaning of the Last Supper of Jesus with his disciples, and of our observance of Communion, or the Holy Supper. And we’ll get to that. But in all that debate and all that interpretation, it’s easy to miss the simple fact that it’s all about eating and drinking. The Last Supper was a meal. And when that large crowd of people followed Jesus, he had them sit down and he fed them. Before we get to deeper, philosophical and spiritual meanings of the Holy Supper, let’s just let it sink in for a moment that the Holy Supper involves eating a meal together. Perhaps it is only small, symbolic portions. But those symbolic portions of bread and wine (or grape juice) are to remind us of Jesus sitting down with his disciples for their last meal together. In other words, the Holy Supper is not only a spiritual act. It is also a physical act. If we were to observe it the way Jesus and his disciples observed it, we would come hungry, and go away full. That’s exactly what the crowd of people experienced on a mountainside where Jesus had gone to escape them. And yet, when they followed him there, he fed them. What is food and drink, philosophically? Now the scene of the story changes. And so does Jesus’ approach to the people. First, Jesus did his walking on water thing at night, to get away from the crowd and rejoin his disciples (John 6:16–21). The next day, when the people realized that Jesus was gone, they got into boats and followed him back across the Sea of Galilee to Capernaum, in the Holy Land itself. And there, after having fed the people, he pushed them to think more deeply about food and drink, and what they should truly be seeking (see John 6:22–51). “Very truly, I tell you,” he said to them, “you are looking for me, not because you saw signs, but because you ate your fill of the loaves. Do not work for the food that perishes, but for the food that endures for eternal life, which the Son of Man will give you” (John 6:26–27). They engaged in this line of thinking with him for about one sentence. Then they were back to food. They pressed Jesus to give them a sign—maybe like that one about their ancestors eating bread from heaven in the desert? In essence, they were saying to him, “Do it again! We want more food!” And who can blame them? After all that tooling around in boats and on foot to catch up with him, they were probably hungry again. Now it’s getting a little hard to maintain that Jesus is still talking about physical food. He apparently isn’t talking about physical life and death either. We know that physically all of his listeners eventually died as well, just as their ancestors in the wilderness had died physically after eating the manna that came from heaven. Jesus has now moved to spiritual food, and spiritual life and death. It helps to know that both the Hebrew and Greek words for “heaven” can also mean sky. So in the most literal sense, the manna was “bread from the sky.” In the morning it fell to earth like rain from the sky, and covered the ground like frost (see Exodus 16:4, 13–15). Here in the Gospel of John, Jesus tells us that he is the living bread that came down from heaven—and he’s not talking about coming down from the sky, but about the spiritual world. Then he goes on to say that the bread that he will give to the world is his flesh. Now, that’s a little weird. And as we’ll see in a minute, his listeners thought it was very weird. According to Emanuel Swedenborg, especially in his most philosophical book, Divine Love and Wisdom, everything in the physical world not only expresses something spiritual, but also comes from spiritual reality. And everything spiritual comes from God. So ultimately, everything that exists comes from God. Everything that exists is kept in existence by God. In a sense, its substance actually is God, because God is continually flowing into it and giving it substance and reality. This does not mean that everything is God. That’s because every created thing is actually a container into which God flows. We could spend an entire semester of philosophy and religion class expounding on how this works. But let’s cut to the chase. When we eat food, not only was that food farmed and harvested and prepared, but it was also given its very life and substance from the life and substance of God. So in a very real sense, our food is God’s flesh. It is the substance of God brought down to the material level as living tissue—plant or animal—that we can eat to sustain our bodies. And yet, Jesus’ words point to an even deeper truth. They challenge us to lift our thinking to a level higher than mere physical food. ­When Jesus said to the people that the living bread is his flesh, they started to argue with each other about it. “How can this man give us his flesh to eat?” they said (John 6:52). And it’s fascinating that it says they argued among themselves, not with Jesus—even though he’s the one who said it. It’s all to answer the critical question: Who among the people has the mind and spirit to understand Jesus’ teaching and follow him, and who does not? Consider how Jesus’ words must have sounded without the two thousand year Christian history and tradition of celebrating the Holy Supper, and thinking of the bread of communion as the Lord’s flesh, and the wine as the Lord’s blood. Jesus pounded away at the people with his words, repeating the phrases several times: If you wish to have eternal life, you must eat my flesh; you must drink my blood. For those who could think only materially, this could have only one meaning: cannibalism. And they recoiled from it. Even many of his own disciples said, “This teaching is difficult; who can accept it?” (John 6:60). Shortly thereafter, it says, “Because of this many of his disciples turned back and no longer followed him” (John 6:66). The ones who turned back and no longer followed him were those who could not lift their minds above material ideas. To them, what Jesus had just said made no sense. It was barbaric. In speaking this way, Jesus was sorting out the people. He was in effect sending away those who could not hear his message—though really, they sent themselves away. The people who remained with him were the ones who could lift their minds higher, and think more spiritually. In remonstrating with them, and pushing them to think more deeply, he said, “It is the spirit that gives life; the flesh is useless. The words that I have spoken to you are spirit and life” (John 6:63). Centuries later, Swedenborg offered a simple, spiritual explanation of Jesus’ meaning: the bread is God’s love, and the wine is God’s truth. Love and truth are the food that sustains our spirit and the drink that quenches our thirst. I could bring in plenty of Biblical support for this spiritual interpretation. For now I’ll leave you with just one: the Apostle John said “God is love” (1 John 4:8, 16). If God is love, then love is the substance of God. Another way of saying this is that love is the flesh of God. Peter understood something of what Jesus was driving at. When Jesus asked his twelve closest disciples, “Do you also wish to go away?” Peter answered, “Lord, to whom can we go? You have the words of eternal life. We have come to believe and know that you are the Holy One of God” (John 6:67–69). Peter understood that it was the words of Jesus that fed them with the bread and wine of eternal life. It was the message of God’s love and wisdom that fed them—and that still feeds us today. And though it is left unsaid here, it was God’s love for them, as expressed in Jesus’ words and actions, that draws all true spiritual followers to the Lord God Jesus Christ. Now let’s bring it full circle. We started with physical food and drink. Jesus fed the people. Literally. He gave them food. Even after understanding the philosophical and spiritual significance of eating the Lord’s flesh and drinking the Lord’s blood, we are not meant to forget the practical and the tangible. Once we have been fed with the spiritual bread of God’s love, and our thirst has been satisfied with the spiritual wine of God’s truth, what’s next? Do we simply go home with our heart and mind full and satisfied, and bask in the glow? As wonderful as that feeling is, that’s not what it’s all about. If we have had our heart and mind filled with the spiritual food and drink that God offers us, we will have received the most basic spiritual food of all: the knowledge that the greatest commandments are to love God with all our heart, soul, mind, and strength, and to love our neighbor as ourselves (Mark 12:29–31). Love is not just a feeling. Love is a force that drives us to act. Love is also the action itself. If we have truly been filled with God’s love and wisdom, we will find it impossible not to love and serve our fellow human beings in practical, tangible ways. It may mean giving them food and drink. It may mean giving them words of encouragement and hope when they are down. It may mean lending them a hand moving some furniture, or mowing their lawn if they are unable to do it themselves. It may mean doing our daily paid or volunteer work honestly and reliably with a desire to benefit the people who are served by our work. However it comes out for each of us, it must come out in action. We do not give our bodies food and drink so that they can merely vegetate and survive. We feed and care for our bodies to keep ourselves fit for service. It is the same reason God gives us the spiritual food and drink of love and wisdom: to make us fit for service to our fellow human beings. This is a written version of a talk recently delivered in Cambridge, Massachusetts. Rev. Sarah just gave a brief sermonette at Common Ground on this exact same subject this past Thursday (I don’t believe in coincidence). At the beginning of her talk, she heavily emphasized something that was totally new to me: the entire concept of this sacrament was deeply offensive — deeply, religiously OFFENSIVE — to the disciples because all practicing Jews at that time strictly followed the taboo in the beginning of Genesis against eating the blood with the flesh of an animal, (in fact, it was a major cornerstone of the Jewish diet) and here Jesus was basically telling them the HAD to do it in order to gain eternal life!. Deeply religiously offensive. And now it’s one of our two Sacraments. Yowza! Thanks. That’s a great point! It’s one that hadn’t struck me before either. Eating blood was forbidden in the Bible all the way back to Genesis 9:1-6, when God first allowed people to eat meat. The prohibition on eating blood there implicitly refers back to the first murder. After Cain had murdered Abel, God said to Cain, “Listen; your brother’s blood is crying out to me from the ground!” (Genesis 4:10). 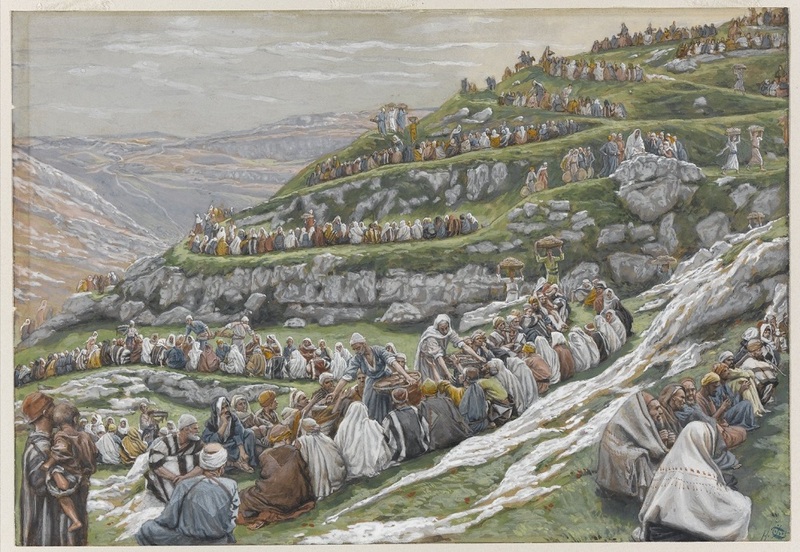 The next verse (Genesis 4:11) is usually translated along the lines of, “And now you are cursed from the ground, which has opened its mouth to receive your brother’s blood from your hand.” However, the Hebrew idiom used could also mean, “You are more cursed than the ground, which has opened its mouth to receive your brother’s blood.” I think it is meant to mean both things. In other words, all the way back in Genesis 4, the ground is cursed because it has eaten blood. So the prohibition against eating blood has very deep roots in the Bible. It goes back almost to the very beginning in Genesis. Later, the prohibition against eating blood was codified into the Law of Moses, which all Israelites were to follow. Thanks for your thoughts. I’m glad you gained a new insight from the article! I also respect your right and choice to believe as you wish, even if I believe differently. The most important thing is that the sacraments give spiritual help to those who take them. “God takes away sin through the sacraments” only in the sense that if we engage spiritually in the repentance, reformation, and rebirth, and the accepting of God’s love, wisdom, and power into our life, that are represented by the sacraments, and taking the sacraments helps remind us to do that, then we are saved, not through the sacraments themselves, but through doing spiritually what the sacraments represent. Jesus Christ did not institute the Catholic Church. He started an early “church,” or community, of believers that became institutionalized a couple centuries later, and split into various factions and sects under the influence of various human beings. The Catholic Church represents only one part of that institutionalized, human-made church. And it cannot even make a ghost of a claim to being the church that Jesus Christ founded after the Great Schism between Eastern and Western Christianity, and after its subsequent abandonment of the teachings of the Bible about salvation and atonement in favor of the new theories of Anselm and Aquinas. Eastern Christianity is, in this respect, closer to the church that Jesus Christ founded than is the Catholic Church. But no church institution existing today can rightly claim to be “founded by Jesus Christ.” Historically, that is simply inaccurate and false. You, of course, are welcome to believe as you wish, and to accept Catholic teachings on this subject. But I continue to believe that those specifically Catholic teachings and claims are mistaken and wrong. However, as I said in my earlier comment to you, although I believe the Catholic Church is badly mistaken about the nature of the Sacraments, those sacraments can still be efficacious for Catholic believers, just as the sacraments administered by other churches can be efficacious, if the people taking them do so in the spirit of accepting Jesus Christ into their heart, mind, and life, repenting from their sins, and living a new life of loving God above all and loving their neighbor as themselves, as Jesus taught. If a person, a church, believes they are eating the actual flesh of Christ and are drinking Christ’s blood do they really know the real Jesus? The Truth. Do you believe Christ will say to them….I didn’t know you? This seems to be a huge discrepancy between the different churches and believers that claim to know the teachings of Christ. The Truth. Whoever does not receive the Kingdom of God like a child will not enter it at all. Praying in my prayer closet. Believing all opportunities, all gifts, all belongings, all chance meetings, all exchanges with others, are Christ’s love I get to share with others around me. Not by my doing. Only to honor The Father in Heaven. I don’t want to over think this. No ego. Just believe as a child believes. Completely, with no hesitation. Seek ye first the Kingdom. In response, I don’t believe anyone is condemned, or even doesn’t really know Jesus, simply because they have faulty religious ideas. Jesus said, “You will know them by their fruits” (Matthew 7:16, 20). Those who live according to Jesus’ teachings know Jesus and will be saved by Jesus even if their churches have taught them some wacky, unbiblical ideas that continue to bounce around in their heads.